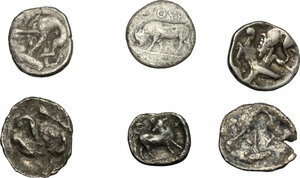 Lots 662 - Central Italy, Alba Fucens. 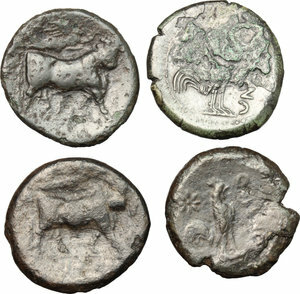 Lot of 2 AR Obol, 280-275 BC. AR. Chipped. 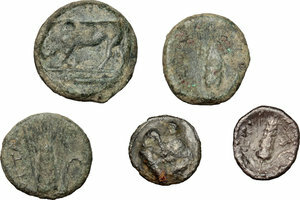 About VF/Good F.
Lots 663 - Greek Italy. 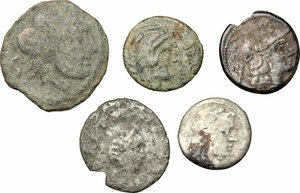 Lot of 3 small AE and 2 small AR coins, including Metapont, Thurium. F.
Lots 664 - Greek Italy. 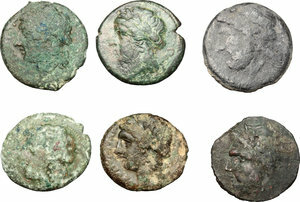 Lot of 4 AE, including Metapontum and Cales. AE. 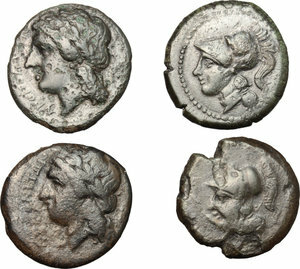 Good F.
Lots 665 - Greek Italy. 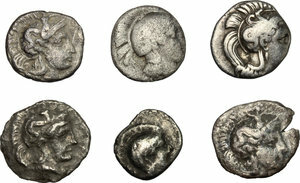 Lot of 6 AE, including Arpi and Neapolis. AE. Good F.
Lots 666 - Greek Italy. Lot of 6 small AR, including Thurium, Tarentum and Arpi. AR. 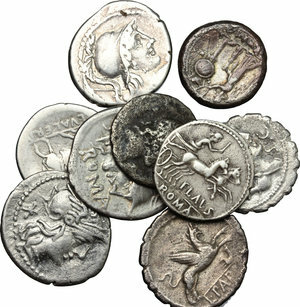 Good F.
Lots 667 - Roman Republic. 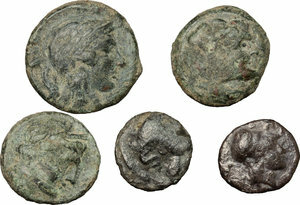 Lot of 2 coins, including an AR Victoriatus and an AE Litra, 3rd century BC. 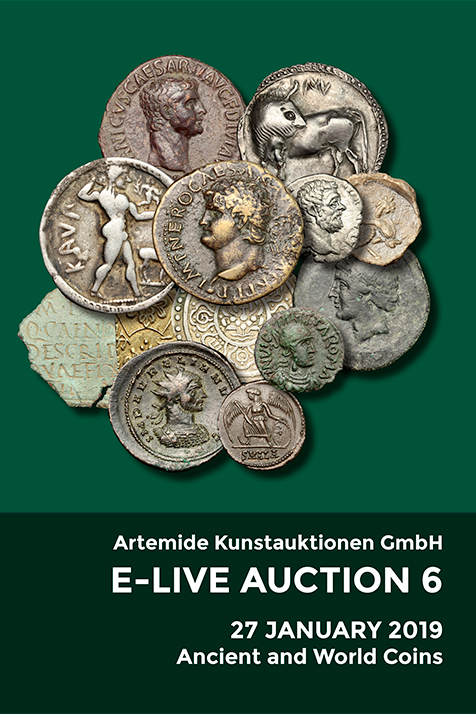 Good F.
Lots 668 - Roman Republic. 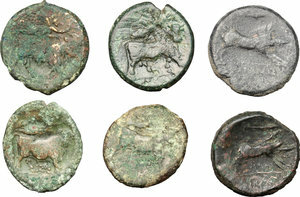 Lot of 9 AR; including: a Victoriatus, Cr. 207/1, Cr. 243/1, Cr. 345/1, Cr. 384/1, Cr. 474/1. AR. VF. 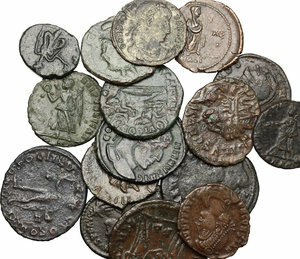 Lots 670 - Roman Empire. 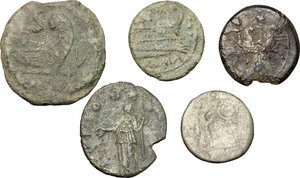 Lot of 17 AE; including 2 late Antoniniani, 3 Barbarous radiate and 6 late Roman small AE. AE. Good F/F.